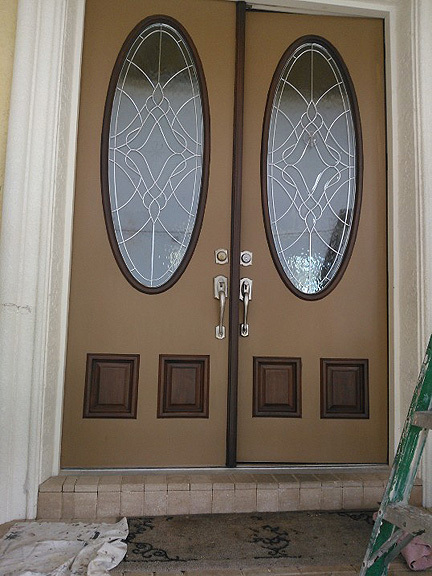 Painting the front doors to look like wood. I finished up my latest project this past week. 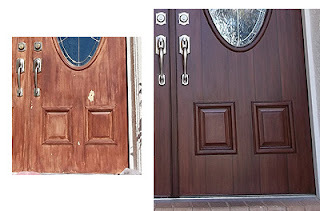 This job was a big challenge because I had to strip off all the old paint layers that were on the front doors. I could tell in that stripping process that there were 6 layers of paint on them. So after starting the job and getting off all the old paint I primed and applied the basecoat color to the doors. 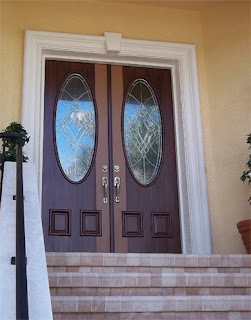 I used a Sherwin Williams color called Toasty with exterior Superpaint. 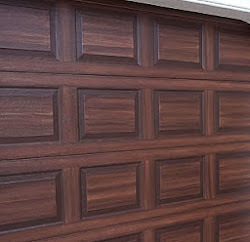 Then after that dried I started to paint the front doors to look like wood. 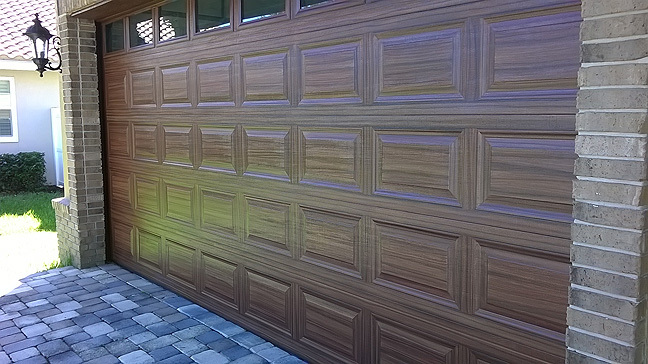 The first day of painting on the wood grain I was able to get the edges of both doors and the 8 panels plus the window trim. It doesn't seem like much for a day's work but the trim always takes the most time. Next day I then started on the body of the doors. I painted the doors to look like they were made with 5 vertical planks on each door. You can see in the next picture that I left the vertical plank that the handles are on for last. I did this because I knew when I took off the handles I would have them off for quite a while and wanted to start that area first thing in the morning. That way by the end of the day I could have it painted and sealed and then start to put the door handles back together. 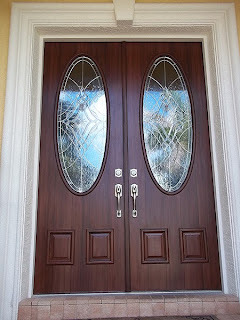 The next photo shows the completed doors. Hard to tell from this photo but in person you can readily see the individual planks painted on. I also painted part of the trim around doors. By the end of the day I got the door handles back on without mishap and all is well. A nice little before and after comparison.